There's a lot new in the Pre. It's not just the phone and it's not just the OS -- it's the underlying ideas and bundled applications too. We're going to try and run down the stand-outs and standards -- from the heady promises of Synergy, to the basic stuff you'll be using every day. Besides things like Universal Search and unobtrusive notifications, another really big idea that Palm has for webOS is Synergy, a contact / calendar management system that aims to put an end to the confusion of having to juggle multiple accounts from multiple services on a single mobile device. Unfortunately, this is probably the aspect of the OS that needs the most work. The Synergy premise is simple: it will take your Gmail account, Facebook profile, AIM identity, and / or Exchange data and merge it all together on your Pre, killing duplicate entries, joining together sources where there's overlap (creating "linked contacts"), and generally making your connected life super-duper awesome. What it actually does is dump pretty much all of your content into the phone without a second thought for what it's letting through the door. If you have a single Gmail account, you'll probably be okay -- it perfectly handles a set of data from one source just fine, and that source would be easily manageable because... well, it's your Gmail. However, it's totally indiscriminate about what contacts it pulls in, which means if Google has auto-saved anything, it's going to be on your phone. That's fine, we're used to this. The G1 does the same thing. The problem really arises when you want your Facebook profile integrated. Guess what? You don't get to say whose info gets pushed to the phone -- every single person you "know" on Facebook will instantly becomes a part of your contact list. And we're talking people who only give you access to their birthdate. How does it feel to have a contact on your phone that is simply a birthday? Annoying. We don't know if you're like us, but we don't want every person we're friends with on Facebook in the contact list for our phone. Facebook kindly provides grouping for different contacts because it appreciates the fact that not everyone has the same kind of relationship. WebOS? Not so much. The system works fine if you don't care who ends up in your address book -- in fact, it works really well at grabbing all that info and sticking it on the phone (while keeping it in sync with server-side changes). Where it breaks down is giving you any kind of tool to really manage and gatekeep the information. Secondly, contact linking doesn't seem to work the way it should -- namely, it doesn't find duplicates in all contacts, whether an AIM, Google, or Facebook account and merge where appropriate. What we discovered is that that adding our AIM account to the Gmail contact list that lived on the phone didn't automatically bring the correct names under one roof (as you imagine it's supposed to). Instead, we had to manually link contacts, even when we could clearly see that the AIM name was already in our Google contact. That's the opposite of what Synergy is supposed to do... we think. We spoke to Palm and confirmed that for now, Synergy isn't pulling in AIM names, only email addresses, though they're considering one of those OTA updates to fix once the device is launched. Don't get us wrong -- there are a number of good ideas at play with Synergy, but it clearly needs some kinks worked out before it realizes the vision that the company seems to have for it. For the time being, we'll likely only be juggling our AIM and Gmail account data, though we're ready and willing to see what happens with that aforementioned OS update. Since contact management with Synergy can be handled in multiple locations, we expected fairly robust options when it came to our address book -- and we weren't disappointed. 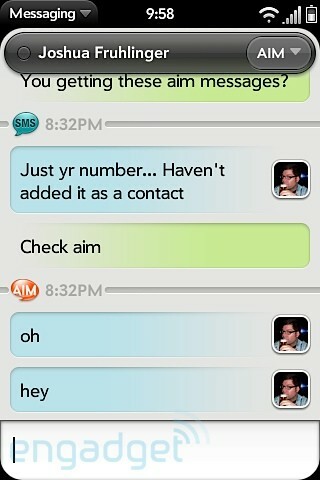 The contact app in webOS is extremely well thought out and easy to navigate. As you'd imagine, if you're using Gmail as your main contact list (as we were), changes to contacts are updated periodically. We were hoping there would be a push and pull, but no luck. Still, you can choose to manually sync when you want to update, and changes seemed to flawlessly take whether we made them in Gmail or on the phone. One option we'd like to see in the future is for Synergy associations to be allowed to migrate back to your Gmail / Facebook contacts. For instance, if you link an AIM account and Gmail contact on the Pre, when you sync back to Gmail, it will add the AIM name to that entry. Still, we think webOS provides a deep and useful platform for managing contacts, despite some of the shortcomings of Synergy. The calendar app, like contacts and email, will automatically sync to your Gmail (or Facebook / Exchange) set and pull data in. Besides offering helpful views in a variety of colors (though not enough variety for our needs -- this app is hurting for user-selectable hues), it also can hook into / be hooked into other applications on the device. For instance, you can buy tickets for a movie via Fandango, and have it drop the event in your calendar. 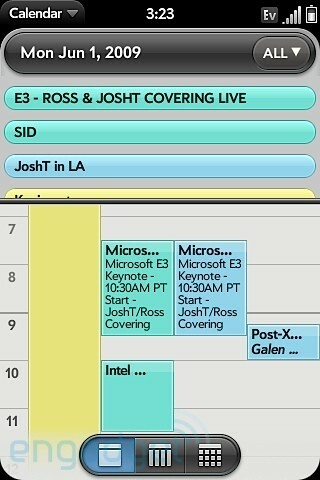 Like contacts, calendar merging is an all or nothing affair, though you can choose which calendars you see in your views. Navigation in the app is actually really clever -- this is the first calendar application for a smartphone that didn't feel like it was trying to cram too much information into too small of a space. Admittedly, the week and month views aren't going to reveal lots of detail to you -- you'll have to go day-by-day to see that info -- but for giving a clear overview of your events (provided you know which colors are which), it does an outstanding job. 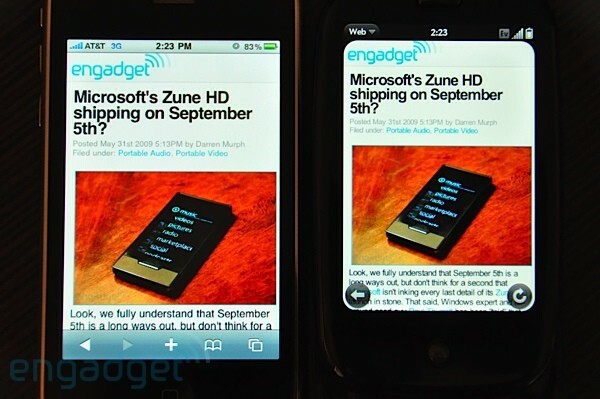 We also liked the fact that it used the familiar left / right and up / down swipes to move through days, weeks, and months, which felt completely native and natural to the webOS environment. It's obvious that as with previous applications, Palm needs to work out the Synergy kinks, but this is clearly a place the company didn't skimp on. Unlike some of the misses in the Synergy arsenal, the way it brings together SMS messages and IM'ing is actually one of the coolest and most interesting parts of the phone. Essentially, Palm has taken the threaded messaging it pioneered in its Treos to the next level, allowing conversations that take place via SMS to be fluidly carried into an AIM or Google Chat session, and back out again. The messaging app on the Pre allows you to simply toggle which service you're using, and keeps all the messages in a clear, easy to read timeline. 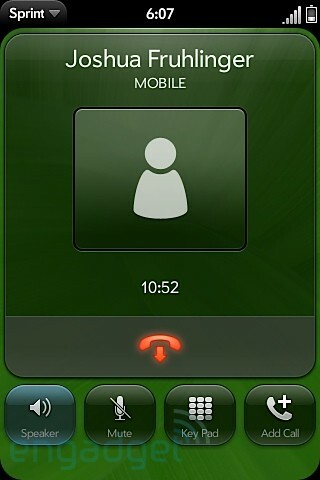 On your end, it looks like the same continuous chat, though you're jumping from space to space. In both theory and practice we love this idea -- it simplifies quick communication, and keeps a thread going where it might otherwise be lost. Visually and from a UI standpoint, the messaging app is clear and simple, leaving room for it to do what it does best. The only danger you have here is confusing the person you're talking to, since they're receiving those messages in multiple places. 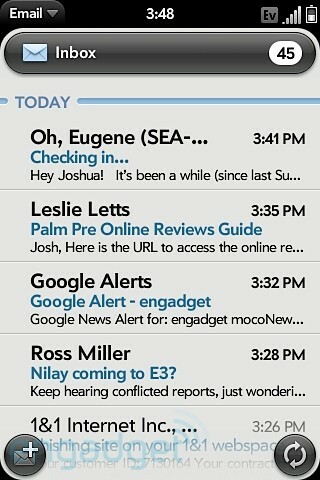 For us, the email application included with webOS is a double-edged sword. In terms of general usage and simplicity, it's excellent, and the inclusion of push Gmail is massively exciting. Unfortunately when it comes to deeper functionality, customizing, or more robust sorting and management options, however, we found ourselves wanting more. A lot more. The basic design of the app is very similar to Mail on the iPhone, save for one big missing puzzle piece: there's no multiple message management. What that means is that you've got to individually delete or file every single message you get -- that was okay in iPhone OS 1.0, but it feels downright outdated here (and Android 1.5's check boxes are real salt in this wound). We're just reminded of what a huge pain it is. For a device that's meant to be focused on getting things done, this is a remarkable oversight. Additionally, we had hoped that since there was such tight integration with Gmail in webOS that we'd see some Google-centric features, such as threaded messages or labeling / archive abilities that played a little nicer with the big G's system. Unfortunately, none of that is present here. You do get to layer accounts, as in other aspects of the OS, though it seems a lot more obvious in mail, since managing multiple accounts in a single pane is really nothing new. Other minor nitpicks concern the lack of options for changing font size, no choice on message preview length, and the fact that all of our emails from the Pre seem to be colored navy blue, and there's no way to change it. C'mon guys. To be clear, mail on the Pre is definitely usable -- especially given push, which usually serves up messages within seconds of hitting the server -- but we would have liked to (and hope we will) see more. 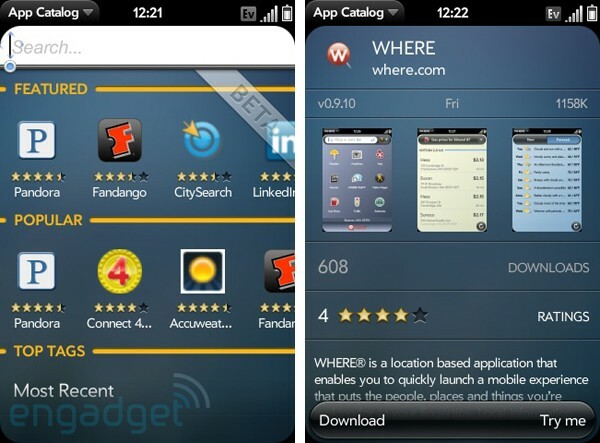 There's lots of room for improvement in this space, webOS or otherwise. The phone app is extremely basic, but we assume that's because hooks for calling out are strewn all over webOS. Essentially you're offered an iPhone-like dialer, which gives you fast access to your voicemail (sorry, no visual voicemail here), contacts, and lists of your recent / missed calls. During a call, you have options for speakerphone, mute, back to the dialer, and adding callers. 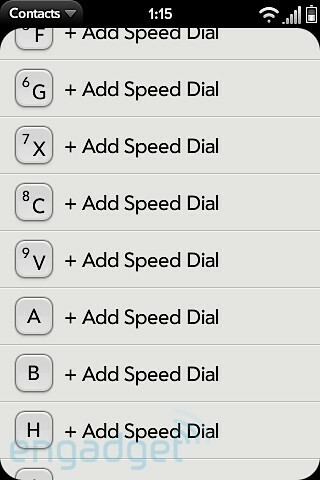 There's nothing drastically wrong with the phone app on the Pre, but there are some gaps in logic that we don't follow. For instance, when you dial digits, it doesn't search your address book for strings and pull up matches from your contacts list... it just lets you dial. And though we had originally observed that you couldn't use the QWERTY to type-to-find your contacts when using the dialer, it turned out there is an option to switch on this functionality. Why it's not automatically switched on to begin with is anyone's guess. Other than a few confusing elements, making and receiving calls on the phone is about as straightforward as one would expect. We were incredibly pleased to see that Palm has included speed dial for your contacts, making use of the entire QWERTY (save for E -- that's for voicemail) for long press insta-dial. 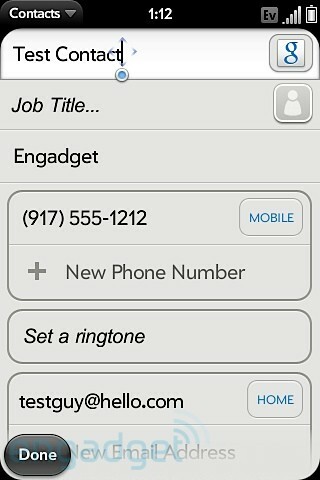 If the contact hunt in the iPhone has you down, this is the antithesis: a beeline to your most used numbers. The webOS browser is obviously central to the operation of the OS as a whole. Since many apps on the device leverage web standards for their core operation, it could be said that the browser is the OS. But in terms of a straight-up web browsing, we found the Pre's out of the box option fantastic -- not only in speed and navigation, but with rendering and compatibility. Built atop WebKit (just as Apple's Mobile Safari), the webOS browser displays pages almost exactly as the iPhone does, though due to the fact that Palm is implementing a lot of hiding icons and app controls, it actually feels like you're seeing more content despite the smaller display. Additionally, its cache management seems better to us, allowing for fairly speedy back and forth through multiple pages. We did see a few rendering issues on pages here and there (like being able to scroll beyond where any content lived), though in defense of the browser, most of them cropped up in places like lyrics sites and old Angelfire pages (we kid, we kid). Zooming is accomplished via double taps as well as pinching, but unlike the G1, the rendering and snap points on the Pre are formatted to follow columns, just as Apple's iteration is. That means that when you double tap on a chunk of text or an image, nine times out of ten you get exactly the right sizing for that content. When it comes to multiple pages, instead of creating tabs, the browser just opens another instance in your cards. This can be a little confusing at first, but once you get used to the idea, it's actually a really great tool for managing a handful of data at once. Meanwhile, history and bookmarks are always accessible from a drop-down menu, but Palm also provides a kind of speed-dial screen when you first open a blank browser page, giving you quick access to your top bookmarks. As far as mobile browsing options go, the Pre is about as good as it gets -- nearly on par with the iPhone in rendering, though more cleanly laid out, easier to navigate, and (in our tests) downright faster. 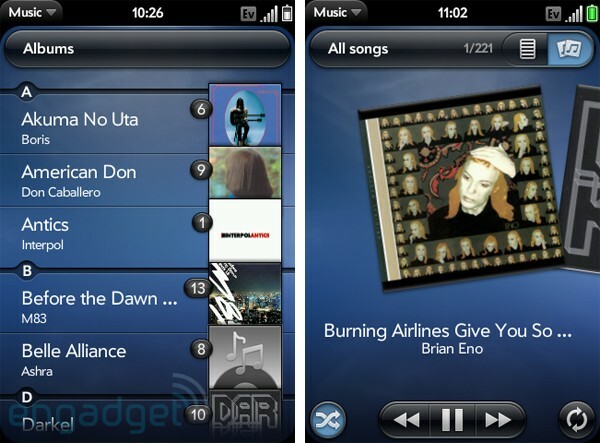 Palm definitely scores with its concepts about handling media in webOS, particularly when it comes to music. First, they've given users more than a single option to load media onto the device, allowing for a straight iTunes sync (more on that in a moment), but also giving you the option of loading media onto the Pre in mass storage mode. The phone automatically recognizes file types and throws them into the appropriate application regardless of location in memory (which means you can organize however you like). iTunes sync (or "Media sync" as they call it), however, really helped ease us into using the Pre as a media device. In essence, the process works exactly as it would if you were using a standard iPod. You get options for (un-DRM'd) music, TV, movie, podcast, and photo syncing just as you would on an Apple device, and in our experience, the actual process was no different. iTunes offers up a contact sync, though it doesn't actually appear to do anything but store a backup file on your phone -- not a huge deal, but it would be amazing if it worked. Regardless, the ability to easily manage your media library will take a big load off of the minds of potential switchers worried about how to deal with a new platform... but we can't imagine Apple is super stoked by the concept. As far as playback goes on the phone itself, we couldn't be more pleased. The Pre forgoes glitz like Cover Flow, instead relying on clearly delineated lists and a really smart (and attractive) shuffle function that make it easy to get around your collection. One of our favorite features is the ability to jump to an artist or song search via YouTube, or an artist search in Amazon's MP3 store while browsing or playing back music. It's a really smart little perk that makes it way easier to go deeper on something you're enjoying -- and it's the kind of 'why didn't anyone else think of that?' concept that makes webOS so enjoyable to use. Video management is pretty straightforward, but we found that's not quite so simple to get that content playing right on the Pre. Mostly the device seems a bit finicky about what formats / conversion types it will take. Anything converted for an iPhone should work perfectly, but if you're throwing on other MP4 / M4V content, you might run into some snags. Obviously, anything protected won't play, and even movies that we'd converted for upload to YouTube (MP4, not Flash, obviously) didn't seem to want to work. Still, H.264 videos we grabbed from the internet, such as a Tekzilla video, played just fine. Running video and music content definitely puts a little strain on the system, and when you've got something loaded up and playing, you'll notice a speed hit in opening / closing of cards and applications. The included Amazon MP3 store integrates with the Pre beautifully, save for one glaring omission: you can't download files over EV-DO. Just like the first iteration of the iTunes Store on the iPhone, you've got to have a WiFi connection if you want to bring down tracks. We don't know if this is a network issue for Sprint, or just a weird quirk the two companies didn't see as a problem, but we're not happy unless we can actually use the Rev. A we've got here. Palm and Sprint: fix it. Just like most modern smartphones, Palm throws in the old standards here. YouTube and Google Maps operate largely as they do on other platforms, though admittedly, we prefer the look and feel on the Pre. 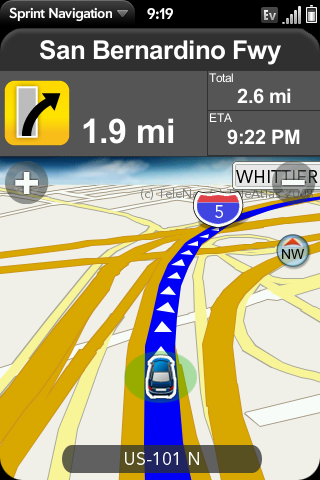 In particular, Maps seems much easier to get around in with its pop-over menu for deeper options. Directions seemed better implemented to us too; webOS gives you dedicated controls which don't alter your view for moving forward and back through each step. If you have to look at the list, jumping into and out of it is a one-tap process. Palm also offers up the kind of utility apps you'd expect. A snazzy looking retro clock, the eye-candy Memos app (sticky notes on a corkboard... cute), a decent calculator which also sports a kind of 70's vibe, and most notably, a Tasks app. The latter is notable for two reasons -- the first being that we're totally in love with the design, which takes more than just inspiration from Moleskine notebooks. Secondly, it's a really useful app that lets you keep sets of to-dos and create due dates and alarms -- though what we'd like to see some integration with Google's recently minted Tasks for Gmail. One other note (no pun intended): we made a promising discovery with Memos -- you can actually search the content of your notes within the application, find-as-you-type and all. 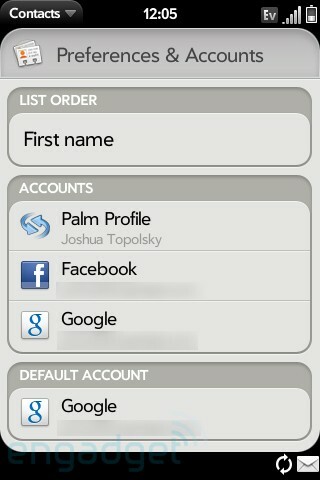 We're hoping it's a sign that Palm means to implement searches for other content in webOS... like email, perhaps? We won't go into detail on every Sprint app included (especially not the NASCAR app), but we wanted to briefly talk about Sprint Navigation. Since most other smartphones of this class either don't come with on-board GPS navigation, or charge you for it, we felt it was notable that Sprint and Palm are giving away what feels like a very usable GPS app with the Pre. We used the software -- which does turn-by-turn / text-to-speech directions -- while driving from San Diego to LA, and it worked flawlessly. Our only complaint is that you can't put the phone into landscape view while using it (hey, what is that accelerometer for? ), and there doesn't seem to be a car mount available, so finding a place to keep it wasn't exactly a cinch. Still, when you consider that this comes as part of any Pre plan you pick on Sprint, it's a really, really nice addition. We're not heavy document users, but we do need to load the occasional PDF or spreadsheet. The Pre seemed to have no trouble opening simple PDF files and Word documents in the two provided applications, though we started to see some nasty memory management issues when we busted out large files, like a 7MB PowerPoint document. PDF View also seemed to buckle under a 3.9MB file, essentially freezing the phone, then giving us a memory warning that we needed to close cards (we only had two others open). Clearly this stuff hasn't been optimized, but we're hoping that when DocsToGo makes its way onto the Pre (apparently it's forthcoming), it will be able to tackle larger files without so much heartache. 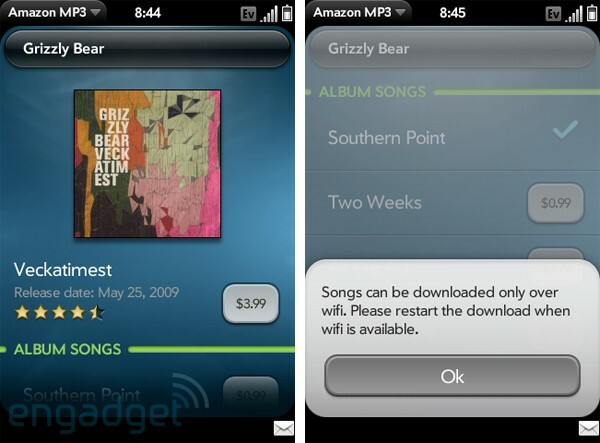 We really liked the interface for browsing and downloading apps on the Pre. Instead of landing on a homescreen which only gives you a small amount of info, right off the bat the App Catalog presents you with a cleanly laid out list of featured apps, popular, and then a nice selection of tag-based sorting methods if you want to go deeper (most recent, category, etc.). Once you get into a tag, you're given a menu for parsing by date added, app name, rating, or cost. Getting more info (including screenshots) and downloading was a pretty pleasant experience, and the layout is spacious but still info-packed; you feel like you're not missing anything. Screenshot browsing was nice (something we regularly desire in Android's implementation), and actual application pages had easy links out to developer websites and support. In case you're wondering, everything was free on our review unit, so we didn't get to try out any pay-to-play apps (thanks guys!). We do have a gripe, of course. App Catalog doesn't seem to support background downloads within the application itself (you can use other apps while it works), so if you begin a download and want to go back a page and browse the list, your file stops transferring. It's a little ironic that the phone which boasts multitasking as one of its big features couldn't give us a queue for ongoing downloads. At the time of this writing, there were but a handful of third-party applications available in Palm's App Catalog for download. Some of the standouts to us include AccuWeather, Pandora (obviously), Tweed, Fandango... and Classic (the Palm OS emulator, in case you've been on a desert island, under a rock, etc.). We're not going to work through all of the applications which will be ready at launch because it would probably make this a four-part review (and no one wants that). Still, we do have a few random thoughts. Classic is most interesting because it shows the possibilities of what the Pre can do -- though it's obviously one of the few here that isn't built using just the web-standard tools which Palm is pushing on developers. To be honest, we had hoped to fire up the app and run Dream Engine, a Turbografx-16 emulator that was a favorite of ours back in the Treo days. Unfortunately, it doesn't look like the app has access to any file systems -- we couldn't get the program to recognize our ROMs folder, no matter what configuration we tried. Attempting to peek at the directory structure with FileZ also proved futile. We're hoping that Palm will open this up a bit more... but we're also hoping they'll open the platform a bit more too. Speaking of, developer courting still seems like an area where Palm needs work. They've got a great OS to work with, but they have yet to really extend a hand to a wide selection of developers or help explain how working in webOS will be beneficial to their business. The platform is nothing without the support of creative and active partners -- just ask Apple. Here's a chance for Palm to further set itself apart from the competition. We're hoping they take it.